Lando Norris (Carlin) scores his sixth win of the season in the 2017 FIA Formula 3 European Championship today at Zandvoort Circuit. 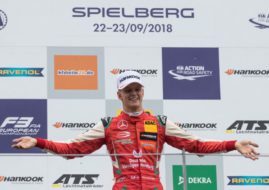 The 17-year-old driver of the #31 Dallara-Volkswagen started from pole and defended his lead until the end of the race, beating main championship rivals Joel Eriksson (Motopark) and Maximilian Günther (Prema Powerteam). Ahead of this race, the championship leader Günther had 18-point advantage over Norris, now the gap is 10 points. Eriksson stayed third in the championship standings. Ferdinand Habsburg started from P2 and finished fourth today at Zandvoort, ahead of Callum Ilott and Mick Schumacher. Other point scorers are Pedro Piquet, Jake Hughes, Jehan Daruvala and Harrison Newey. It’s was the race almost without overtakings. The most exciting moment was Turn 1 accident after the start, when Ralf Aron was pushed by another car and he hit David Beckmann. Both Aron and Beckmann went to the gravel with Beckmann’s car upside down. Luckily, the young German was unharmed. Two more F3 races at Zandvoort are scheduled for tomorrow.